Things move fast in an auto repair shop and having tools that move as fast as you do is essential. When it comes to your auto repair information tools, the only solution is ProDemand® with 1Search. This exclusive auto repair software streamlines the search process to bring together a unique combination of OEM data and experience-based Real Fixes. 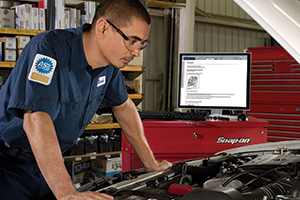 With a single lookup, you get everything in one convenient application that you need to repair the vehicle. Our latest innovation to improve your information lookup, 1Search Plus returns information in a unique graphical layout aligned with the way a technician thinks about diagnosis and repair. OEM and real-world information are fully integrated, reducing your navigation time. All results are returned in more specific categories, leading you directly to the information you want and cutting out the clutter. If you haven’t encountered ADAS — Advanced Driver Assistance Systems – in your auto repair shop yet, you will soon. You already know ADAS features as things like adaptive cruise control, parking assist sensors and blind spot indicators. All of these technologies (and many more) fall into the new category of vehicle systems known as ADAS. ProDemand makes it quick and easy to diagnose, calibrate and repair these systems. Simply select a vehicle and click the Driver Assist (ADAS) Quick Link button, and you have immediate access to a table that consolidates all the ADAS information for the vehicle in a single location. You get the full picture of the ADAS features and components and can simply click to select the repair and calibration information you want. There’s no need to perform multiple lookups to find each piece of information separately. ProDemand also lets you know if the components of an ADAS feature will require calibration, special tools or scan tools in order to complete the job. Select your vehicle faster by entering your customer’s license plate number, which ProDemand instantly converts to a VIN. You will work faster and more accurately with fewer characters to enter, helping increase overall productivity. Our best-in-class scalable vector graphic (SVG) color wiring diagrams let you zoom in on the most intricate diagrams with no loss in clarity. You can select individual circuits to highlight, isolate, and then print in full color. In ProDemand, wiring diagrams are created with a consistent style across all OEMs, so you can easily read any diagram for any vehicle in the database. You don’t need to know how different OEMS display their diagrams, so you’ll spend less time in front of the computer and more time under the hood. With every lookup in our vehicle repair software, the “Top 10 Repairs” is clearly displayed on the dashboard with the most common components, codes, symptoms and lookups for your current vehicle. Chances are good that other auto repair professionals have experienced the same vehicle issues you face in your shop. Our “Top 10 Repairs” list puts this collective knowledge, based on millions of actual repair orders and insight from professional technicians, right at your fingertips. Having this supplemental auto repair information as a point of reference can save you a ton of time on your own repair. ProDemand Mobile lets you access OEM and expert-based repair information right at the vehicle – where you need it most. ProDemand is optimized for tablet devices, making it easy to retrieve and view your content anywhere you work on vehicles. Never miss a TSB again! With ProDemand auto repair software, TSBs are delivered with the vehicle lookup so they’re always quickly accessible. New TSBs are added continuously to ProDemand, often within two weeks of publication from the OEM. So you can be confident you’re accessing the most comprehensive, accurate and up-to-date database of TSBs available. The Quick Links feature contains links to the most commonly looked up information in the product. You’ll get a head start on your maintenance tasks and repairs with this handy tool that gives you direct access to common specifications and procedures. ProDemand plays OEM video and audio media clips in conjunction with repair information for select vehicles. You can easily identify vehicle sounds by listening to that sound in an audio clip. And you can view procedures being completed in “live action,” just as you would expect to see them in your bay. ProDemand gives you access to vintage data and vehicle repair information for domestic and import service manuals going back to 1974. Use the standard vehicle selector to see engine mechanical, engine performance and tune-up, HVAC, and chassis information, along with electrical and wiring diagrams for a wide range of import and domestic cars and light trucks. Vintage data is fully illustrated, including photos and diagrams.